Choose your new men's Nike tennis shoes among the hundreds of models available in the vast assortment online. a lightweight fit and maximum support. Discove Air Zoom Zero, choose the evolution! Show off a perfect style in the field with Nike men's tennis shoes, are made with the most innovative technologies on the market. Models cared for, revolutionary and able to guarantee the stability of the foot in the movements and the correct supports in the races towards the net without neglecting the freshness of the foot and the evaporation of the sweat. On Mister Tennis you will find the Nike models for every playing surface, the best known tennis shoes and even the limited edition ones. And if you want to take on the role of great champions, choose Nike Vapor X, Roger Federer's choice in perfect balance between style and technology, or Zoom Cage 3, Rafael Nadal's tennis shoes. Just a few clicks and Nike men's tennis shoes are already in your home! 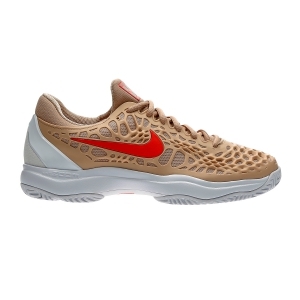 All Nike men's tennis shoes that you see on the site are available in stock and ready to be shipped after a few hours. You will be surprised by the speed with which we process your order, delivering it to your home or to the address you indicated in 3/4 days. Practically after your last click you may already start to warm up. Your satisfaction for us is everything. You have a good two weeks to evaluate your new pair of Nike tennis shoes and if they are not to your liking you can return it for free within 14 days from the date of receipt. After receiving the tennis shoes and verified we will refund the full amount.